Question: Is it correct to say that we shouldn’t necessarily take everything our acaryas say literally? 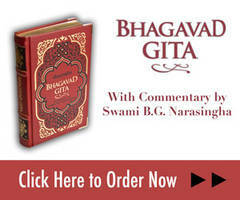 We don't blindly follow as Srila Prabhupada has written in the purport to Bhagavad-gita 4.34, correct? Answer: We should accept our previous acaryas (parama-guru etc.) in whatever way our own guru has accepted them. Having firm faith in our guru is the key to all success in Krsna consciousness. Of course, that pre-supposes our having accepted a bona-fide spiritual master, one who knows the science of Krsna. Statements by our guru, or previous acaryas, that may be seen as relative are not the statements made regarding the Absolute Truth, but statements concerning relative topics like politics, weather, health, etc. Absolute statements about relative subjects are rare, but sometimes occur. Most statements, true or false, about relative subject matters are relative in any case. Why ‘we don’t blindly follow’ as Srila Prabhupada has mentioned in the purport to Bhagavad-gita 4.34 is in reference to not blindly accepting a spiritual master in the first place, as is the case in many instances in today’s Vaisnava world. It does not refer to how one should follow the guru after having accepted initiation. If the guru is bona-fide (sad-guru) and knows the science of Krsna, then yes – one could follow blindly, as in the case of ‘the rope is a snake.’ However, if the guru one accepts has meagre knowledge of the science of Krsna, or has become envious of pure Vaisnavas, then the disciple has to be attentive and intelligent enough to save himself. Although Gaudiya Vaisnavism has spread all over the world, it can be said that it is weaker now in proper siddhanta and proper behaviour than ever before. Quantity does not always guarantee quality. The 'big institution' can simply become a 'big mess', failing in its original purpose. In fact, it is usually the case when quantity increases, quality decreases, or when quality increases, quantity will decrease. This we can see practically – the big institutions become absorbed in expanding their properties and numbers, whereas smaller independent groups of devotees and preachers, though fewer in numbers, are more concerned with quality and proper conception. We once heard that in the ________ Maharaja camp there were 200 devotees at a kirtana in Los Angeles and all were crying in ecstasy! I for one did not take it seriously because I know for certain that real ‘ecstasy’ is not that common – it is very, very rare, su-durlabha. That everyone was crying, I could believe because shedding tears comes easily for Sahajiyas and sentiment-mongers. But to say that they were all in ‘ecstasy’ is self-deception. All our reading, researching, listening to hari-katha, etc. is to one end and one end alone, and that is guru-padasraya and guru-nistha, to take shelter at the lotus feet of Sri Guru and His Grace with firm faith and conviction — without which, we are lost, a ship without a rudder or a captain. Accepting the asraya of guru is actually the first step in bhakti-yoga. If this step is omitted, then all other practices are futile. In the following verse, Srila Rupa Gosvami gives us the first four steps in the practice of sadhana-bhakti. 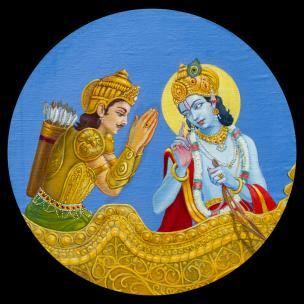 If one has lost faith in his diksa-guru due to the guru having meagre knowledge of the science of Krsna, having abandoned the principles of bhakti-yoga or having become envious of the pure Vaisnavas, then one may be left with little recourse but to take shelter of the holy name and the sastra. However, the example of being cast into the ocean without a boat or a captain is appropriate here. In the ocean a life-jacket, or even a lifeboat, may keep one afloat for some time, but not forever – one must reach land or board another ship sooner or later, otherwise death is certain. One cannot simply float around the ocean forever. Similarly, if one has lost faith in his guru for genuine reasons, then taking shelter of the holy name and the sastra will sustain one for some time, but not for all time. With the help of the holy name, sastra and sincerity within, we must again find the asraya of sad-guru. Otherwise, we remain in limbo. We may attain some karma-misra-bhakti or jnana-misra-bhakti, but we will never reach the goal of jnana-sunya-bhakti, pure devotional service. Guru-padasraya is the greatest of our necessities to be fulfilled. I appreciate your questions because I think you are intelligent and sincere, but at this time, I think the Lord in your heart is your best friend and guide. Search with all earnestness and you will find what you are looking for.